Discussion in 'Ski School' started by Sandy Powell, Apr 18, 2018. I thought I would start a thread on shaped skiing. A bit of background first. I work as a ski instructor and have for the last 4 years. I started skiing a good 37 ish years ago. Had some basic race training as a kid and my father worked at a ski area for 4 years. One thing I have always heard over the years was lean forward, put pressure on the down hill ski. Ironic or not I became very proficient at A frame skiing. Something I have done for a good 36 ish years. I've managed to race on leagues and teach skiing yet never got away from A frame skiing till recently. Of course I missed quite a few years of skiing and then jumped onto shaped skis. Obviously I came back to skiing with a lot of bad habits from old skis. Also a bad understanding of what needs to happen. You can put all the pressure you want on the down hill ski. You can lean forward all you want it's not going to give you more angles. It also will not keep you from A frame skiing no matter how much you shrink that inside foot. Recently I started working from the feet up and something happened. The A frame went away. Hip alignment resolved itself. Once I heard start from the feet then move up and it makes so much sense. I am frustrated as an instructor that we don't teach pinkie toe leads the way. Everything starts from the feet, the inside foot to be more specific. From the shortening of the inside foot to putting pressure on the pinkie toe. It leads the initiation of the turn the outside ski follows, it doesn't lead. Why do more people not talk about the importance of inside foot? If you have someone who can't get out of a wedge have them point the inside knee out. All the sudden the wedge will go away. It's really the key to moving from a beginner to an intermediate skier yet it's never really talked about. 1chris5, tromano and LiquidFeet like this. Actually, it's the key to moving from a perpetual intermediate to a true expert. I learned to ski from Lito Tejada-Flores, and know of no other way to ski. Pat AKA mustski, Tim Hodgson and newboots like this. I am not sure who Lito Tejada-Flores is but I will check out his videos. In the past people that knew I was A framing never mentioned initiating from the inside. When I mentioned it to a level 3 PSIA instructor he was upset. He stated that will lead to leaning with the body. Then he tried to tell me again all about forward pressure and bottom ski as the focus. I think it's the opposite if you are not leading with your pinky toe then you are leaning. We ended up skiing that day in powder and I had on slalom skis (I don't own wide skis). After we skied a while and talked more he stated I was probably right. I have even been on another ski forum mentioning white pass turns and that it should come from the inside. They talked me out of it so that was another year wasted trying to add more pressure to the down hill ski... very frustrating. I wouldn't go as far as to say intermediate to true expert is initializing from the inside because skis have changed. Over the years people like Phil Mayer didn't initialize from the inside, they where true experts. The old style of skiing was lifting the inside foot up, body motion up and down as well as a lot of other wasted energy. The way around initializing from the inside was to lift the ski. Ski shape has changed and with that people need to learn how to utilize them. Not enough drills, courses or even instructors are told to start from the inside. I don't even see videos from skiers talking about initializing from the inside. The only thing I ran into was one article from effective skiing online that mentioned it. Don't expect to revolutionize skiing conversation by your personal discovery. The little toe has been "power steering" for a long long time. Even in the age of the "straight ski". Tip 'em, they will turn! Not enough drills, courses or even instructors are told to start from the inside. I don't even see videos from skiers talking about initializing from the inside. The only thing I ran into was one article from effective skiing online that mentioned it. Little toe edge release is a cornerstone of the Clendenin method IIRC. It's also one of the quiver of techniques taught by Canadian certified instructors. geepers and cantunamunch like this. From the shortening of the inside foot to putting pressure on the pinkie toe. It leads the initiation of the turn the outside ski follows, it doesn't lead. Why do more people not talk about the importance of inside foot? To initiate a turn, instead of lightening and tipping the inside ski, you are advocating pressuring and tipping the inside ski? Tricia and Erik Timmerman like this. To me it feels more like just rolling the (new) inside ski over to the little toe edge, which causes weight to transfer to the (new) outside ski progressively through the turn. But then I'm neither an expert skier nor a former racer nor an instructor, just an enthusiastic amateur, very amateurish at that. And I'm not really very kinæsthetic either. elemmac, newboots and Sandy Powell like this. Not at all. The inside ski should have around 30% of the pressure. Here is how I see the order: Shift your hips over the new outside ski, start shortening the inside leg and actively tip it at the same time. Push that inside leg toward the hill as far as you want to generate larger angles. Aft and forward pressure are managed based on snow conditions and not a rule of always be forward. When going through powder, slush less than desirable conditions you have a more central body position. Also for the record I understand that we are all taught somewhat basic steps on tipping the inside ski. I am not talking about getting out of a wedge. Everything that I have heard has always talked rolling the inside foot out to get out of a wedge. Then it's not really mentioned at a high level again as most people focus on forward pressure and the downhill ski. It's almost as if the inside foot becomes an after thought and what I am saying is that it's key. In order to shorten that leg you have to transfer weight. You need to have proper hip alignment to tip that inside ski and shorten it. Everything in that focus is not outside ski, but how to shorten and tip the inside. If you are trying tip any other way your body ends up leaning. If your focus is not tipping the inside you end up with an A frame. It might not be revolutionary to new skiers since they are taught to roll to get out of a wedge, but it is to me. I watched Lito Tejada-Flores and couldn't even get past 10 min. His skiing is the exact opposite of what I am trying to achieve. He might say some of the right things, but what I saw in his skiing was wrong. He is rolling the inside foot only because his skis are two inches apart and he is leaning with his body. He has no separation of his upper body and what makes it worse with too much rotary motion. That is not at all what I am looking to emulate. Look up JF Beaulieu or Jonathan Ballou, but they still don't mention the inside ski. The inside foot IS extremely important, its tips, lightens, and pulls back. BTW closer to 0 percent is how many perceives their inside ski balance. The outside foot takes all the balance and force generated by inside foot activity. Back to OP balance on the outside ski as well as inside foot activity are both paramount of getting out a of wedge, as is boot alignment for getting out of an A frame. You have an A frame due to boots not compensating for your bodies alignment the correct way. Curious why do you want a wide stance? 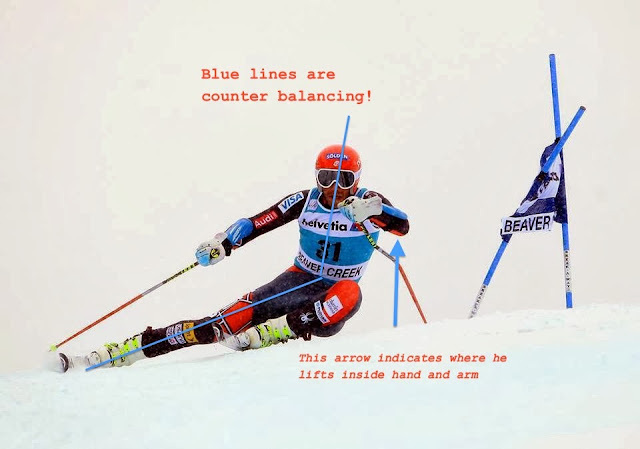 objectively speaking what does wider help us do to ski performance? how wide is to wide? how narrow is too narrow? You state that Lito only rolls the inside ski because his ski are 2 inches apart.......can Lito still achieve enough edge angle to accomplish their turn? what would going to a wider stance help Lito achieve? what negatives would Lito have by going to a wider stance? David Chaus, CalG, Mendieta and 2 others like this. I've said it several times, but angles are resultants, NOT goals. Everything starts from the feet. "Push that inside leg toward the hill as far as you want to generate larger angles." ...and you'll get a load of people hip dumping and 'making angles' on perfectly prepped surfaces, but any variation in terrain or gates will prove in a moment that they aren't in balance. Balance = versatility: bumps, groomers, steep, not steep, wedge turns, performance arcs, powder... etc...... and absolutely agree with Josh on (severely) questioning the 'wide stance' mantra. razie, David Chaus, Tony S and 4 others like this. I don't like seeing the word "push". Nothing should be pushed, it's about gravity and flow. You turn the skis, not push the ski to the new direction. Or at least that's how I see the CSIA model. jimmy, Magi, elemmac and 2 others like this. You are right that PSIA does not promote an across-the-board focus on initiating turns by releasing the new inside ski before doing anything with the new outside ski. Most skiers know that the outside ski, during the turn, does carry the weight. That's why there's all this focus on starting a turn by doing something to get that pressure started. I think this is the source of the focus you've encountered on initiating a turn by doing something with the new outside ski. It works in skating, right? But there's the resulting lazy new inside leg and foot, annoying A-frame, and a tall transition which makes difficult to get the inside leg short before the fall line. You are right that being tall in transition and carrying an A-frame will never get a skier those angles you just posted. This movement pattern keeps the body low through transition and allows the skier to get higher angles before the fall line and eliminates the A-frame (given good boot fitting). Pressure comes to the new outside foot by the fall line on its own. I'm a PSIA instructor. I agree, it would be good if PSIA National talked deliberately about different types of initiation, and discussed a flex-to-release initiation with its advantages as compared to an extension initiation. But National allows the regions to do their thing, and does not address initiations this directly and insistently in its publications. In my Level II exam, I said "extend-to-release" several times because at that point I understood that extending the new outside leg was the organization's preferred initiation strategy, and I passed. But I use an extension release sparingly in my groomer skiing, and I teach a new inside foot/leg initiation in my teaching. I'm not race-trained, by the way. Lito is old-school, but his books are wonderful and he does promote a flex-to-release initiation. You might need to read the books to get that piece though. He has a way with words. geepers, Superbman and David Chaus like this. Hi Mark I remember you from epic ski and a few other members on here. Yes your right you can get into hip dumping. I don't know when that point happens. I have never actively focused on the inside ski till the last few months. The goal of course is balance, which brings me back to inside foot and what it does. I don't think you can achieve balance by thinking outside in. From my experience anyways thinking outside in gets you into body rotation, leaning, and having that inside ski skid around. I also realize you can get into hip dump thinking inside out but as you stated it's about balance. Either method could be overdone and get you the wrong results. Wide stance is not probably the best wording. More or less you need an athletic stance. To me having feet two inches apart where boots are touching is too close. Leaning with the body and not having separation at the hips is not right. Actually you don't really turn the skis either, you put a ski on edge, flex and extend. So your right in a sense push is not the right word. When I am using that I mean actively engaging your knee to the inside toward the hill. You are right that PSIA does not promote an across-the-board focus on initiating turns by releasing the new inside ski before doing anything with the new outside ski. Liquid, yep that is my point PSIA doesn't promote anything to focus on the inside ski. I think that is sort of a failure in some regards. Yes, I misunderstood what you originally said. I can't see this working for me. If it works for you, great! I put close to zero pressure on the inside foot during turns. It's just skimming the surface. The inside foot IS extremely important, its tips, lightens, and pulls back. BTW closer to 0 percent is how many perceives their inside ski balance. The outside foot takes all the balance and force generated by inside foot activity. I've said it several times, but angles are resultants, NOT goals. Everything starts from the feet. Balance = versatility: bumps, groomers, steep, not steep, wedge turns, performance arcs, powder... etc...... and absolutely agree with Josh on (severely) questioning the 'wide stance' mantra. I concur. I ski with a pretty "narrow" stance, like Lito does, because it feels comfortable and natural. Sometimes my skis would be a little more apart, especially on steep slopes, but that's also a resultant (in an effort to balance), not a cause. It's rare for me to see someone these days who's read his books (or should I say book, since almost of his instructional writings are in one book? ), least of all a PSIA instructor! I'm aware of PMTS, but I've never actually bought it as it seemed like the same methods taught in a more intricate/technical way, just so it can be marketed better as a system, thereby generating more sales. And also, more thinking steps mean more thinking on the slopes and lower enjoying the actual skiing. So, as someone who's read them, what are your thoughts on Harb's PMTS compared to Lito's methods? JF describes it as the inside being the Decider, and the outside as the Rider. Not sure I agree with your movement pattern to initiate a turn, moving the hip over the new outside ski. Did you mean something else? jimmy and razie like this. "Breakthrough on skis" was inspirational for me, even though in hindsight I didn't absorb all that much of what he was teaching. "Breakthrough on the new skis" was an update written after shaped skis became popular. There are lots of schools of thought out there about inside and outside ski contributions. Just when I find a way that works for me, and I think it should be the golden standard, I find great skiers that say the opposite. Most of the weight on the outside ski is pretty common among great skiers. Initiating the turn with the inside ski is a hallmark of PMTS, but they also teach weight on the outside ski. Did Lito chronicle in his film below PMTS in its infancy at 21:29? Lito's techniques seem similar to Harb's, just Harb skis more aggressively for greater edge angles. I think you'd have a hard time criticizing Harb's skiing in Lito's video below. I don't think high edge angles are Lito's goals. There are many other great skiers that don't talk about focusing on initiating the turn with the inside ski, but yet their skiing is marvelous. Lito Tejada-Flores was born in Bolivia and spent many years at Aspen. I think he's been retired for several years. A couple of his main ideas were to put the majority of one's weight on the outside ski (by lightening the inside ski) so that ski would bend more and turn better. Related, have the skis turn you; you don't turn the skis. Many of Lito's videos are old and show the skiers on old long straight skis. That will account for some of the technique difference to what we do these days. Saying something like "put 30% of the weight on the inside ski" is pointless. How does one measure 30% of the forces--gravity plus centrifugal force? It can't be measured nor estimated with any accuracy or consistency, therefore it's pointless and perhaps confusing to suggest it. For stance width, how about this--how about walking width? Our bodies have been balancing us on one foot at a time every step we take since we were a year or two old. That's what our bodies know--don't mess with Mother Nature. A stance wider than has the problem of making it more difficult to retract that inside leg to get it out of the way so we can develop those good angles with the snow. And "stance width" is not how far the feet are apart. The racer in the photo above has a very narrow stance. The "width" is how much of a divergent angle the legs make. If the legs are just about parallel, that's a narrow stance, even for the racer above who has his inside foot next to his outside knee. Stuck in a wedge? Get mad at whomever taught the wedge in the first place. There is no reason at all to teach a sliding wedge, stem christie, etc., to any learning skier on modern equipment. Teach them the snowplow wedge to safely stop in a lift line, then have them begin making basic parallel turns by the afternoon of their first day. It works with no problem. They discover the wedge christie and pass through it to a parallel before they ever get a christie habit, therefore the bad habit never forms. Do not teach anything that has to be un-learned.